We are one of the leading Trader and Supplier of Scientific Hydrometers. Since our establishment, we have become the well-known manufacturer and supplier of Jawa Brix Hydrometers. The offered hydrometer measures the difference in gravity between pure water and water with sugar dissolved in it by flotation. This hydrometer is developed by utilizing finest quality material and contemporary technology, under the strict supervision of our experts. We provide this hydrometer on diverse specifications within promised time frame as per customer’s necessities at nominal rates. We are an unparalleled name in offering a premium quality range of Light Liquid Hydrometers. Our offered hydrometer is manufactured utilizing supreme class components and cutting-edge technology in compliance with the set norms of the industry. 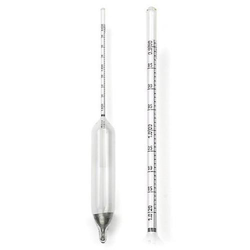 This hydrometer is stringently tested on numerous parameters so as to deliver a defect free range. 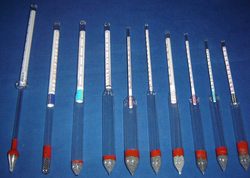 We offer this hydrometer in various specifications as per the needs of our valuable customers. We are an eminent manufacturer and supplier of high quality Baume Hydrometers. The provided hydrometer is developed in conformity with the international quality standards utilizing high grade material & modern techniques. Offered hydrometer is quality tested on well defined parameters by our quality experts so as to deliver a defect free range. 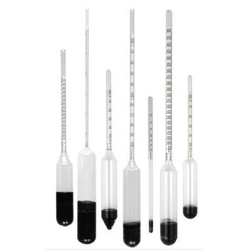 We offer this hydrometer in bulk quantity to our customers at nominal price. Looking for Scientific Hydrometers ?